I meant to add this to the end of my post yesterday, but got so carried away with the wonderfulness of Shetland Wool Week and forgot! 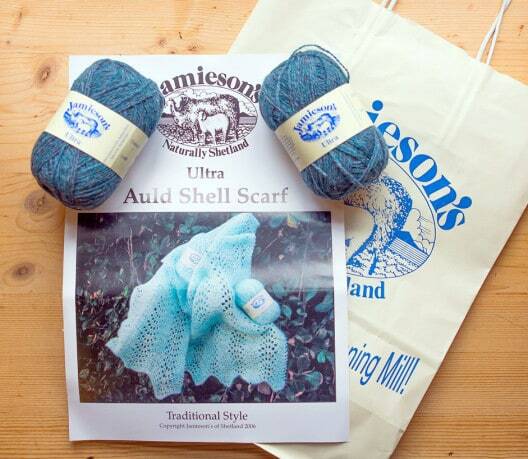 I got a goodie bag from Jamieson’s Of Shetland Mill when I took the wool week tour last week. Inside are two balls of the lovely Ultra yarn in the Titanic (151) colourway. This is a very soft laceweight yarn which is 50% grade 1 Shetland wool mixed with lambswool. In addition to the yarn there is a great pattern for a traditional lace scarf. As I have the luxury of being able to nip to their shop any day I want, I thought it was only fair to share this prize with a lovely reader instead. To be in with a chance of winning just leave me a comment here and tell me which is your favourite colour from the shades dyed at the Shetland mill – there are lots to choose from! I might see what other goodies I can find to add in. 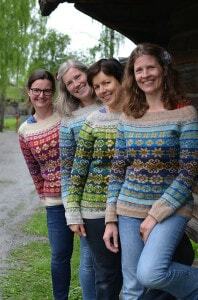 If you haven’t already entered there is also still time to enter the giveaway to win one of three Next Year In Lerwick pattern, by Tori Seierstedt. I met Tori in Shetland (at the mill!) and she had the sweater with her (apologies for the blurry pic, I was a bit in awe of the lovely sweater. All you need to do is go to the post for Episode 11 and follow the instructions there to enter. Entries for both these prizes close on Friday 24th October. Good luck! You weren’t kidding abut having lots of colours to choose from. So much choice. I think I like “Yell Sounded Blue” best. (Although that may change if you ask me a different day) I’d never considered that a yell sounded blue before but now it’s got me thinking. Does a whistle sound yellow? The colour name is Yell Sound Blue. It’s the name of the stretch of sea between Mainland Shetland and the island of Yell. I just adore all the colours and also love the natural earthy shades of Jamiesons wool. I knit a lot with the natural colours so need to look outside the square but cannot decide between Leprechaun and Gingersnap. Lovely prize and posts about shetland wool week, thank you! Struggling to pick one so it would have to be either Jade, emerald or mermaid. Difficult to choose with so many lovely shades but my favourite is Peacock. Heliotrope, it sounds lovely and it looks lovely next to Waterlily. So many colours! My fav colour they have, if I have to pick just one, is 175 Twilight. It reminds me of the wings of insects. Love it! It’s such an amazing palette of colours for this wool, but if I had to pick one, I’d choose Prairie. I am dreaming of visiting Shetland Wool Week myself one day! i like Dewdrop, it would really sing in stranded colourwork. Choices, choices, but as the weather gets gloomier, I think ‘cornfield’ would be quite cheery on a dark day. Wow, difficult to choose only one but it would have to be Bramble for me as it reminds me of country walking. Thanks for all the lovely posts from Wool Week. I so hope I can go next year. Moorgrass has to be my favourite and I love their wool. I’ve really enjoyed reading about Shetland wool week and seeing your photographs, thank you. Mogit is my favourite colour. I hadn’t realised how many shades Jamieson’s produced! Such a hard decision but I think I would go for storm. All are my favourites but I pick Raspberry. Thanks for offering. Love their yarn. Jade and mint are two colors that I tend to use over and over. I’ve never actually used Jamieson’s, but I really like the descriptions of the colours- much easier than the numbers used by Jamieson and Smith! I love the look of ‘autumn’- what a gorgeous colour, so complex and rich. Very jealous of all those who have been enjoying Shetland Wool Week, it looks like it’s been wonderful. 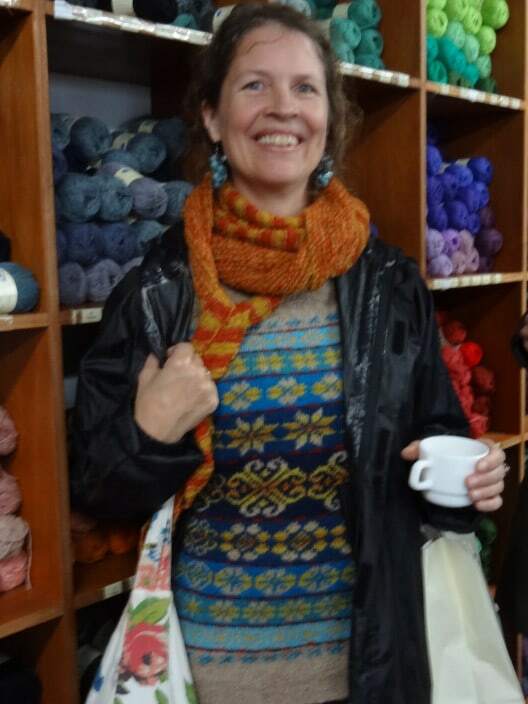 Thank you for taking us along with you to Shetland Wool Week, Louise! And thank you for the giveaway! So many lovely colors…each time I look through the pages, I find another “favorite” so I’ll stop perusing now and say Clyde Blue. About this time of year I start hankering after some brighter,warm colours to counteract all the wet leaves and I dig out all my bright tops. So I would have to go for POPPY, which has the perfect blend of warm without being too in-yer-face)and bright,to remind me that the flowers will bloom again one day! So thoughtful of you to share. Lots of lovely choices and inspiring colour names. My choice would be Loganberry. There are lots of shades I love but if I have to chose, it would be Purple Heather. What a nice idea for you to share. 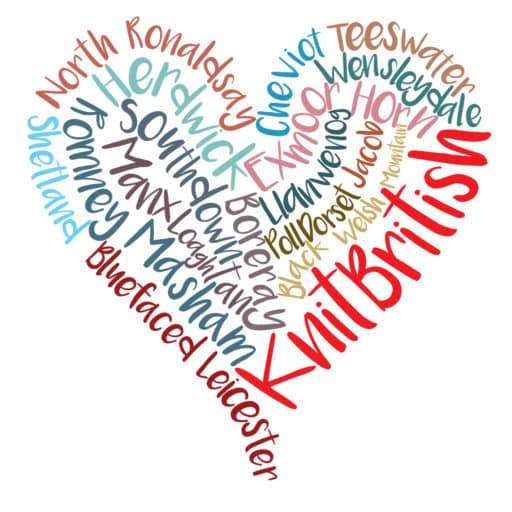 And its wonderful to read about Wool Week first hand in your blog. I think my favorite color is Grousse – although there are so many, it is hard to choose – I think there are many favorite colours in their yarns. Thank you. my fav this week has to be pumpkin, such a cheerful colour for a rainy day. You were right so many to choose from! Damask or Mirage have so much light in them. I can’t wait to order some! And thanks for sharing Wool Week with us! Have learned so much about the Shetland Islands! The colours are all gorgeous, but I especially love “autumn”. I also thank you for your thoughtfulness to include your readers. I love love love Moorit! That is my favorite color! Again, thank you. oohh the choice… hmm rosewood? Dusk? Tundra??? So many lovely colours to choose from, I love the highland mist colourway. I have really enjoyed your wool week updates, One day I hope to get there! I have nearly finished my hazel tindell shwook hat just trying to get the Shetland wool week feeling from Chester! I love 272 Fog! I used that for a base color in my Acht hat. I remember standing in the mill store picking out color after color. So much fun!! Hoping to go back next year. Wow, I never realised there were quite so many colours available! It’s so hard to pick a favourite. I think it might be 187 Sunrise because I can see the flashes of brighter red through the dark and I just love the effect. So hard to choose one…..Celtic is in-my-face stunning!! So many colours….. So many dreams of patterns……… So many uncompleted projects…… my favourite colour from the mill has to be… SUNSET ! It just glows fabulous!. As I scrolled through, I kept thinking “That one, no that one”. In the end I’ve settled on Sunrise, but I’m sure I’ll change my mind next time I look through the colours. Such a lovely range of colours but I think my fav is Seabright. When I think of Shetland, I think of all the wonderful colors of the sheep. Then you add on all the other colors, just makes it harder to pick. So, at this moment, I will have to pick #107 Mogit. Way way to much choice! There were loads I could have gone for but I will say Twilight. There were some great greens though and I love the ones with different colours blended together. Mine would be 1260 Raspberry… though I love everything in their purple/berry colour range! Wow, this has really opened my eyes to what Jameison has to offer. So many wonderful colours, it must be a full colour palette. I really love Foxglove, but I am so glad you are not asking me to actually choose, I am the worlds worst procrastinator! I love Duck Egg – such a lovely, soft blue! There are so many beautiful colors. But, if I have to pick one, I’d go with Sapphire! I love all shades of blue but this one is the vest. This is so tough for someone who has trouble making decisions! I kept changing my mind as I scrolled through the colors. I think I am going to settle on Mantilla. Thanks for the opportunity. I have enjoyed your posts on Shetland Wool Week. An impossible task! At this very moment, my favourite colour is the 243 Storm, but next time I look, it will change! And wow – the greens! Amazing! 676 Saphirre is my favorite. Dear Louise – wow, look how many people have already commented: your little prize is very popular! I visited Shetland earlier this year and have spent the past week so frustrated at not being able to return for Wool Week – it’ll be quite a while before we can afford another trip to your side of the world. But next time Wool Week will have to be part of the agenda! I think the Autumn colour looks great – I like green, but this one has a bit of the orange from autumn in with it. Lovely. If I HAD to have just one favourite, it would be the Amethyst in the Heather/Marl yarn. 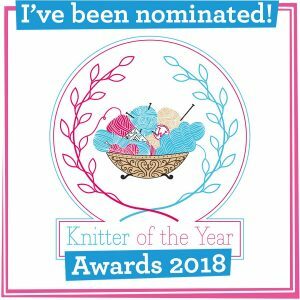 I’d be just as happy to win the Titanic laceweight though!! OOOOH!! Soo hard! Lupin or Mermaid my faves. What a lot of lovely colours to choose from. Daffodil is my favourite, but very difficult to choose! 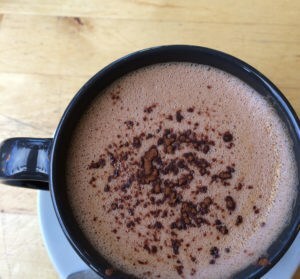 Espresso! I had no idea there were so many colors.Thanks! I’d have to say one of my new favs is ‘Titanic’ you show above, as it has such depth of colours within it. I went to the Shetlands this summer and I cannot wait to return ! All colours are beautiful but the 286, moorgrass, is appealing to me. So many lovely shades! I think spruce is my very favorite. love the Shetland wool and all the colours. However, as I am craving colour either scarlet or ginger! All the colours are wonderful but I do love Yellow Ochre and Midnight! I am totally into greens. Especially “Leprechaun” looks lovely. I really like the Moss colour, and have been lurking on their website for some time now. But I must finish my wips before I indulge again! So hard to narrow the choice down to one favourite colour. At the moment it would be Bluebell (665). I go through this every time I’m ordering! So many beautiful shades it’s difficult to choose but Loganberry appeals to me – I could eat it! Hoping to make Shetland Wool Week next year! Oh my! This is an impossible question! So many! Wow, that is an overwheleming amount of colours. I shall certainly keep this in mind for my next colour work project. My favourite is 585 Plum. Sunrise, Royal, or Lime. Probably sunrise. Love the paprika colourway – has all the heathery bits of autumn mixed up in it! How can you make us choose one?!? I love blue so I tried to pick one… oh well… I’ll say 162-Neptune. Such a difficult choice. I am between Cornfield and Loganberry. Cornfield because it is bright and summery (and we are currently in spring) and Loganberry because of the earthy berry tones. All are wonderful colours! Erm peacock, no cornfield, no loganberry, no Neptune, no…erm…peacock! Clematis and opal are my favourite colours but very difficult to choose. J&S have so many extraordinarily beautiful colours. My mother used to do a lot of Fair Isle knitting (sadly she can’t anymore,due to shoulder problems) and I remember playing with the J&S shade booklets when I was small (as well as being a swift for countless skeins of J&S yarn). I love the marled shades like Titanic and Pacific. Yes, both jamiesons of Shetland and jamieson & smith have excellent colour palettes. 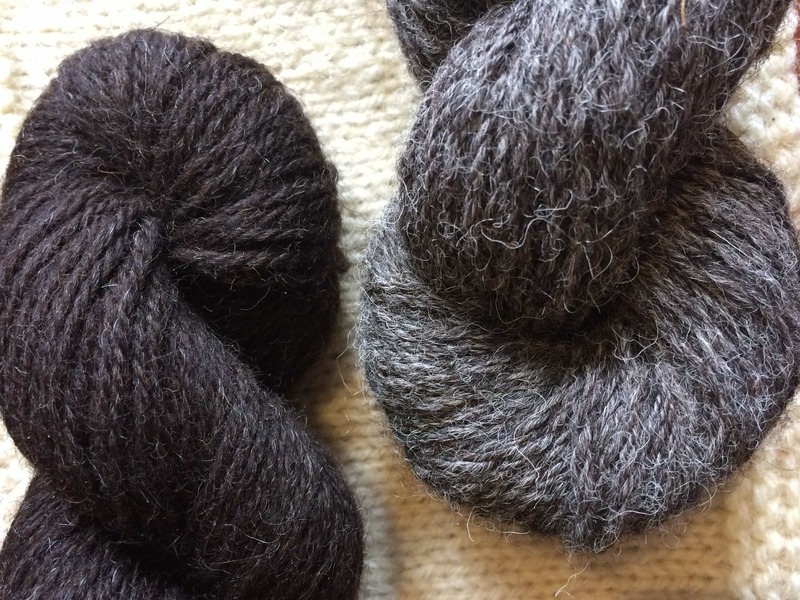 I love that these two separate companies are producing fantastic yarns from the sheep in Shetland, but with their own distinct colours and feels. What a lovely prize but it so difficult to chose a colour, they are all so beautiful. I love a lot of the natural shades but for the coloured ones it would have to be sky, I love the subtle shades in it, from the stormy grey through to clear blue. Everything you get in a British summers day. I can sense a definite feeling of indecision coming on when I finally make it up to Shetland! After much deliberation, I think my favourite at the moment is ‘Sherbet’. Gorgeous color selection. How do you pick just one? I’ll have to go with my partiality to purples and pick 598 Mulberry. Thanks for sharing this trip with us. Logan berry I finally decided on! Many many beautiful colours to choose from though! It was almost impossible to choose, but Seabright caught my eye – I love the name too – it conjures up images of sunlight sparkling on waves! Thank you for that link to the Jamieson’s website – what a feast of colour! So hard to choose, but I’d pick Yell Sound Blue, with the bonus of its great name. Loving the wool week posts, and your generosity. I would choose Mirage, which reminds me of Shetland on a hot* summer day, where the sea, sky, beach and moor merge in the distance. * For the disbelieving, the worst sunburn I have ever had came after an afternoon on the pier at Lerwick, when my scalp was blistered through my hair with the intensity of the sun bouncing off the harbour water! My favorite color, hands down, is cornflower. We also did a tour of the mill, but we did not get goodie bags. Sigh. Love the pattern, too. Aubretia is calling to me. Definitely purple but with a nice bit of pink and blue to catch the eye. What a great idea for a competition. Thank you! I have to confess to owning the shade card at home and I sometimes open it up just to have the pleasure of trying to decide which colour I like best. It’s a tough choice, but I think 151 Titanic is my fave: it reminds me of walks along my favourite pebbly beach on the North Sea coast. Everybody seems to be having trouble choosing just one color, and I’m no different. As I went through the colors, I found myself leaning towards the heathery shades: sunset, moorgrass, woodgreen, rosewood, bramble, and many others. But Sunset caught my eye most, so that’s my choice. Wonderful giveaway – thank you so much! Anyways, my favourite colour that I’m currently knitting with is ‘Petunia’ – gorgeous dark pink with flecks of purple shades. We recently visited the mill while we were on holiday – had to buy a shade card so I can pet all the pretty colours! i have two favourites. One being Titanic. I just bought a sweaters worth in Spindrift. The other being Seabright. So many amazing colors to choose from! It’s hard to decide, but I think my choice would be 130 Sky. I like all shades of blue, but this is very delicate and it preserves some of the wool natural tints. My favourite colour in “Salmon”. It has the occasional fleck of blue, and sometimes yellow, through it – reminiscent of the salmon jumping in the River – the slightest glimpse just to tease! It probably doesn’t count to say “all of them”! so I will say #1260, “raspberry”. I knit Kate Davies’ Scatness Tunic with Jamieson Spindrift, and love the yarn and the colors! I loved reading through all the posts and everybodies favourite colours. I was lucky enough to have visited jamiesons shop last week when I was in shetland and picked up some wool.So many wonderful colours to choose from!! My favourite colour would have to be oceanic. Thanks for posting blogs etc. so I can read all about Shetland Wool Week as I missed it. Rosewood is my favourite as it has so many colours in it. Loganberry is great up close and personal! All the colours look wonderful. Wow – how to decide! It’s amazing how mant different colours have been chosen as favourites. I love all the heathery ones but I think I particularly like Scotch Broom. I love shades of grey and Granite in particular, is the colour of my husbands beard! Perfect shade of red for me. My favourite colour is Jupiter. Beautiful colours and I’d like to see them all up close!! Cobalt 684 seems an especially nice shade of blue. Too many lovely colours to choose. Today i’ll pick Gentian. Thanks for the opportunity. 243 Storm is my colour, reminds of the my wonderful stay on the Shetlands last year. My favorite color is and always has been paprika. I worked for a family run knit shop called Creative Yarns here in the states, for many years. At the time, we were the only stockist of Jamieson and Smith Shetland wools in our area – southeast US. I miss those days. I loved ‘playing with colors’ of shetland, helping my knitting students and customers plan their own Fair Isle patterns. Thank you for this opportunity to comment. I really enjoy reading your blog and the comments on Facebook. Should you choose me, I would love the prize, of course! It’s the luck of the draw, I am afraid. I’m a Swedish knitter and I love knitting fair isle. The colour I like best is Seabright. My Ravelryname is EvaL8. If you look there you will se my fair isle knitted sweaters and cardigans. Wasn’t woolweek amazing! I have never been to the mill. A good idea for next year…! And what a huge amount of colours. I will pick ‘moss’. It is so Shetland.